One of Costa Brava's most characteristic towns, Tossa de Mar is a town of pre-Roman origin, with its old town-center surrounded by a fortified twelfth century wall. A lot of new hotels and constructions have recently been added to the modern part including luxury hotels and boarding houses (there are more than 70 hotels), without detracting in any way from the charm of the original fishing port. 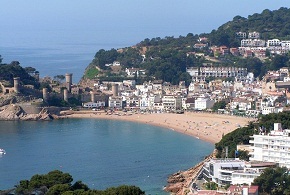 If you arrive in Tossa de Mar by sea, before setting foot in the village itself, you arrive at La Roca del Moro (The Moor's Rock), the Cala del Molta, La Cambra and Els Cars. But the very first indication that you have reached Tossa de Mar is the unmistakable cove "Es Codolar", a very narrow bay enclosed by steep cliffs, at the foot of the town's walls. It used to be the natural harbor of Tossa de Mar. Fishing boats can still be found, almost hanging from its rocks. The cove is topped by the old homage tower, and has for centuries furnished the most spectacular elements contributing to the charm of Tossa de Mar. If you round the "Cap de Tossa de Mar", with the lighthouse on its summit, the closed curve of Tossa de Mar's beach comes into your view. The beach is naturally divided in two sections, Mar Gran and Mar Menuda. The first one is split lengthways by the capricious "riera" (stream) and the rocky section "Ses Glorietes", where little bays are formed. The second one, Mar Menuda is the beach in front of the little island La Illa. 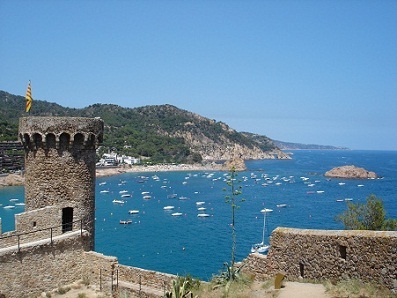 Numerous artistic and archaeological discoveries contribute to the antiquity of Tossa de Mar. Once the Iberian Tossa de Mar settlement had developed, with its commercial contacts with the Greeks, the Roman city emerged, from which great mosaic paving is still preserved. On these, one can read the name of the town Turissa as well as the artist's or owner's name. The medieval fortified walls of the Vila Vella (old town), for which Tossa de Mar is renowned all over the world, show us that this town has also been important in more recent times. Today Tossa de Mar has become a great centre of international tourism, comparable in popularity with similar famous cosmopolitan resorts. Tossa de Mar provides its tourists the already-mentioned excellent beach, and its two natural harbors- the wild and lonely Cala Bona and Cala Pola. The typical streets, white-painted and evocative, its museum with its valuable collection, plus the constantly changing newer attractions such as night-clubs and similar establishments offer Tossa de Mar a place in the top resorts in Costa Brava. If you continue up the coast and go out of Tossa de Mar in the direction of Sant Feliu de Guixols, the coastal tracks seem to disappear. The route is determined by the Sierra de Tossa de Mar, with its highest point - the peak "Puig de Ses Cadiretes"- reaching 522 meters. It is the steepest and most spectacular in the area, and from the top the view is amazing.